We have all seen and loved the now iconic, ‘Daag Acche Hain’ Surf Excel campaign. The commercials have been so successful that Surf Excel is still using the communication after more than half a decade. Spreading goodness, in line with the overarching campaign thought, is a new CSR initiative on Surf Excel Matic’s Facebook Brand Page titled ‘Spread The Magic’. The concept and execution are simple. 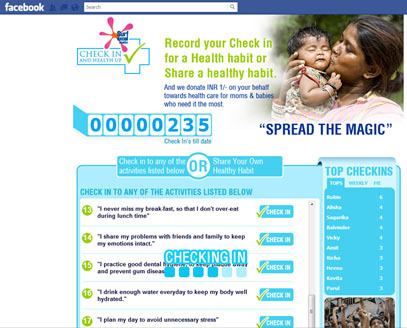 Users need to access the Health Check-In Application and ‘Check-in’ on any of the listed good health habits they practice. If they don’t find any in the given list (much like me), they can add their own. For every user check-in, Surf Excel donates 1 Rupee towards healthcare support for underprivileged mothers and children. The more you check-in, the more money the brand contributes. I tried on a couple of browsers but there seems to be some issue with the check-ins as they don't get submitted. I hope it gets fixed soon. The Brand Page Wall pushes this application via frequent posts to its half a million fans. This is a great way to leverage social media platforms and let consumers contribute via small actions to important social causes and make a difference. The positive rub-off on the brand is also unquestionable. What this now needs is a QC and some real promotion, so that more users chip in. The brand page is well managed with frequent interactive updates for ‘Matic Moms’ around bringing up their kids and repartees for messages that users leave. We are all for a good cause.